I counted some clichés, but the suspense is so effective that I easily suspended disbelief. Invincible monsters that now rule the Earth have wiped out most of civilization (how much extinction is hard to say) in A Quiet Place. The key survivors are one farm-bred, well-behaved family that has mastered the art of staying near silent. The monster-aliens that are part arachnids from “Starship Troopers” and part humanoid interlopers from “Signs” are blind and thus attack their prey when sounds are made. Any crackling sound from one person means that they are a goner within moments. Of course the cliché is this: in the last third there are a lot of close calls because one character or another evades certain death just in time. If there were no aliens and the central heroic family were the last people on Earth, they would have a picture-perfect farm to forever live on. There are rows and rows of cornfields which gives the movie some kind of horror majesty since there are just lots of visual tricks that can be done with it. There is a suspenseful escape by two kids as they go down a grain elevator (the best scene of its type since 1985’s “Witness”). And the best visual idea is to decorate the farm with hanging color-twinkle lights that are used as a warning beacon. 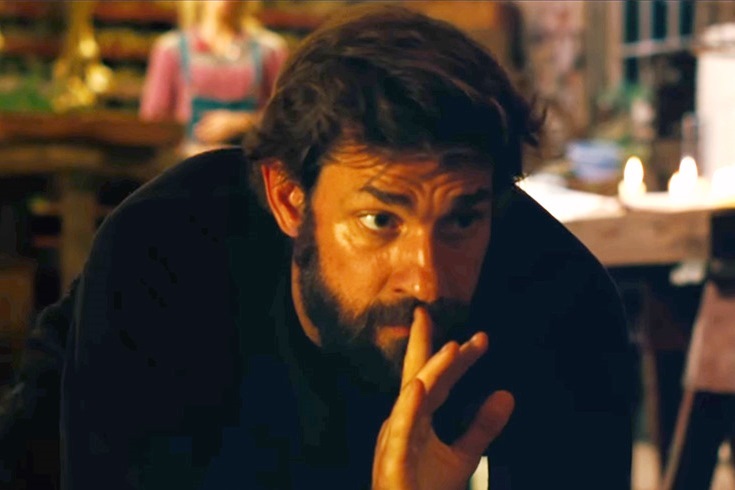 John Krasinski is the sure-hand director of this picture, and he also stars as the dignified father, good-willed but just flawed enough to make some crucial mistakes starting on day 479. When it tells us the date on the title card it’s telling us the monster attacks started that many days ago or the world was nearly extinct from population that many days ago. Who’s to say? 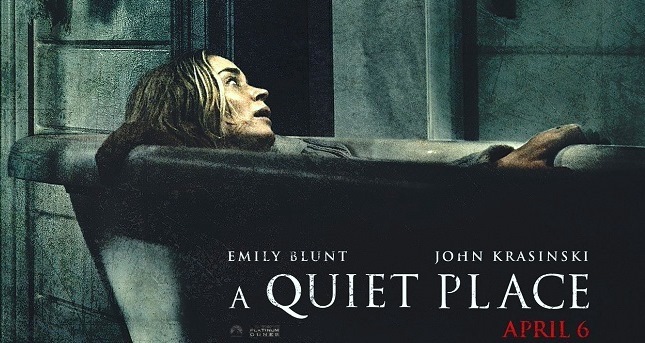 There’s only about a hundred spoken words in the film, and those words plentifully take place behind a veil of waterfall or deep inside a basement. Emily Blunt is the pregnant wife who goes into labor sooner than expected. How they deal with a newborn crying baby is ingenious. And while any newborn does sleep a lot its first day of life, this baby too conveniently stays quiet where there is a monster visitor who has broken into the farmhouse and is lurking about. Whatever, you got to forgive the film for that. Two other cast notables are Noah Jupe as the young son not ready yet to do man-like things in this post-apocalyptic world and Millicent Simmonds as the deaf daughter who is perturbed that her father doesn’t dole out enough responsibility for her to take on. The film has an efficient set-up so it can deftly lead to a final second half that is a chain reaction of suspenseful predicaments. I am a bit annoyed that each of the characters take a little too much risk that calls the monsters’ attention when it was avoidable. It’s formula. But at its best the film is superbly photographed and exploits all the farm props to clever effect. There might well be three good goosebumps that you will have during its run time. Film Cousins: “Night of the Living Dead” (1968); “Signs” (2002); “Z for Zachariah” (2015); “It Comes at Night” (2017).